Stiliyan Petrov's late equaliser denied Crystal Palace a place in the quarter-finals of the FA Cup and kept alive Aston Villa's hopes of a second Wembley appearance of the season. The Eagles were on the verge of an unlikely fifth-round victory when Petrov plunged to meet Stewart Downing's corner with a diving header to hand Martin O'Neill's side an 87th-minute equaliser. The cash-strapped Championship club led twice through goals by Johnny Ertl and Darren Ambrose, but were pegged back first by James Collins and then, cruelly, by the Bulgarian. A replay is not the worst outcome for the Eagles, who went into administration at the end of January with estimated debts of £30m and will at least see their bank balance benefit from a trip to the Midlands. But it is the last thing Villa wanted, especially as their rematch with Palace will take place in the week leading up their Carling Cup final against Manchester United at the end of February. O'Neill has never reached the quarter-finals of the FA Cup as a manager before, a strange anomaly for a manager who has won the League Cup twice with Leicester and the Scottish Cup on three occasions with Celtic. But he made his intentions here clear by picking a strong side featuring first-choice goalkeeper Brad Friedel, and two England hopefuls in Ashley Young and Stewart Downing, and his team initially took the game to their hosts. Most of the visitors' early chances came from moves down either flank and the Eagles were fortunate to survive when Claude Davis beat Richard Dunne to Emile Heskey's knockdown. Villa also felt they should have had a penalty when Ashley Young went down under a challenge from Nathaniel Clyne after running on to Petrov's neat through ball. The pressure was enough to silence the home fans, but they soon had something to shout about when Ertl gave them an unlikely lead after 25 minutes. Friedel, starting his first cup tie of the season in place of his usual understudy Brad Guzan, could not reach Ambrose's corner and the Austrian midfielder rose to plant his header in the back of the net. Villa are not used to going behind - Friedel has kept a clean sheet in eight of his last 11 league games - but their response was as efficient as it was impressive. Soon after Young's whipped cross from the right just eluded the onrushing Heskey, Downing fired in a fierce free-kick from the same flank for Collins to nod home at the near post. By now the game had developed into a classic Cup tie and both sides had further chances before the break - Heskey and Petrov heading over for Villa, while Palace's best effort came when Ambrose's deflected free-kick forced Friedel to punch clear. The tempo did not let up after the break, with John Carew - on for Heskey - testing Speroni with a snap-shot on the turn from the corner of the six-yard box. But from then on chances dried up at both ends until Palace regained the lead through a strike of real quality by Ambrose after 70 minutes. The former England Under-21 international stepped up to smash home a 30-yard free-kick after Petrov fouled Nick Carle, with Friedel unable to keep the ball out despite getting a hand to it. Things almost got worse for Villa when Ambrose sent a looping header on to the top of Friedel's crossbar but they came back strongly in the closing stages. 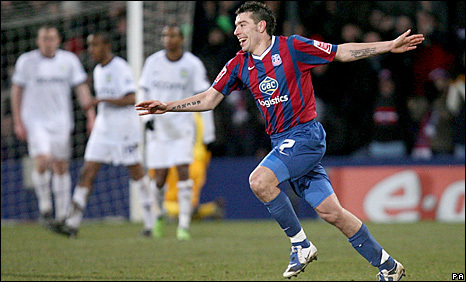 Palace initially held out, with Speroni producing a cracking save to tip the ball over after Richard Dunne flicked on a free-kick and Carew nodded goalwards. The Argentine keeper was less convincing from the following corner, though, flapping at thin air and then turning to see Collins's close-range shot blocked on the line by Clyne. But he did brilliantly to keep out Carew's close-range header from Young's clipped cross - only for the Eagles' resistance to be finally ended from the resulting corner. 90:00+5:06 The game is over, as the referee blows his whistle. 90:00+1:33 Julian Speroni takes the direct free kick. 90:00+1:33 Substitution Calvin Andrew is brought on as a substitute for Alan Lee. 90:00+1:33 John Carew challenges Claude Davis unfairly and gives away a free kick. 87:59 Corner taken right-footed by Ashley Young, save by Julian Speroni. 86:28 Assist by Stewart Downing. 86:28 GOAL - Stiliyan Petrov:Crystal Palace 2 - 2 Aston Villa Stiliyan Petrov finds the net with a headed goal from close range. Crystal Palace 2-2 Aston Villa. 84:09 Inswinging corner taken left-footed by Stewart Downing from the right by-line to the near post, save made by Julian Speroni. Ashley Young takes the inswinging corner, save by Julian Speroni. 83:33 Stephen Warnock takes the free kick. 83:33 Booking Alan Lee booked for unsporting behaviour. 83:29 Foul by Alan Lee on Stephen Warnock, free kick awarded. 82:15 James Collins challenges Clint Hill unfairly and gives away a free kick. Free kick taken by Julian Speroni. 81:52 Free kick awarded for an unfair challenge on Ashley Young by Alan Lee. Direct free kick taken by Richard Dunne. 80:10 Free kick awarded for an unfair challenge on Claude Davis by John Carew. Nathaniel Clyne takes the direct free kick. 79:19 The offside flag is raised against Nathan Delfouneso. Indirect free kick taken by Julian Speroni. 75:40 John Carew takes a shot. Save by Julian Speroni. Inswinging corner taken by Stewart Downing from the right by-line, James Collins takes a shot. Shaun Derry gets a block in. Corner from left by-line taken by Ashley Young. 75:23 Direct free kick taken by Luke Young. 75:23 Booking Danny Butterfield shown a yellow card. 75:18 Nathan Delfouneso fouled by Danny Butterfield, the ref awards a free kick. 73:44 Free kick crossed right-footed by Darren Ambrose from right wing, Ashley Young gets a block in. Outswinging corner taken by Darren Ambrose from the right by-line played to the near post, Stephen Warnock makes a clearance. 73:44 Substitution Nathan Delfouneso joins the action as a substitute, replacing Fabian Delph. 73:44 Booking The referee books Fabian Delph for unsporting behaviour. 73:39 Free kick awarded for an unfair challenge on Johannes Ertl by Fabian Delph. 72:54 Stephen Warnock crosses the ball, save by Julian Speroni. Correction - 71:35 Darren Ambrose takes a shot. 71:35 Alan Lee takes a shot. 70:21 Free kick awarded for a foul by James Milner on Neil Danns. Direct free kick taken by Nathaniel Clyne. 69:25 GOAL - Darren Ambrose:Crystal Palace 2 - 1 Aston Villa Free kick scored by Darren Ambrose from 35 yards. Crystal Palace 2-1 Aston Villa. 68:46 Stiliyan Petrov gives away a free kick for an unfair challenge on Nick Carle. 67:31 Centre by Ashley Young. 65:20 The ball is sent over by Luke Young, save by Julian Speroni. 63:59 The referee blows for offside against Ashley Young. Free kick taken by Julian Speroni. 62:44 Free kick crossed right-footed by Ashley Young from left wing, Neil Danns makes a clearance. 62:44 Booking Claude Davis goes into the book. 62:42 James Milner fouled by Claude Davis, the ref awards a free kick. 61:27 Inswinging corner taken from the left by-line by Darren Ambrose. 60:56 Stewart Downing is caught offside. Indirect free kick taken by Julian Speroni. 58:55 Foul by Shaun Derry on Stewart Downing, free kick awarded. Stiliyan Petrov takes the free kick. 54:43 John Carew gives away a free kick for an unfair challenge on Johannes Ertl. Julian Speroni takes the direct free kick. 49:16 John Carew takes a shot. Save by Julian Speroni. Corner taken by Ashley Young, clearance made by Alan Lee. 48:40 Shaun Derry gives away a free kick for an unfair challenge on James Milner. Richard Dunne takes the direct free kick. 47:59 Nick Carle sends in a cross. 47:14 Nathaniel Clyne fouled by Ashley Young, the ref awards a free kick. Nathaniel Clyne takes the free kick. 46:30 Shot by Alan Lee from deep inside the penalty area misses to the right of the goal. 46:00 The referee blows for offside against Fabian Delph. Free kick taken by Julian Speroni. 45:31 John Carew gives away a free kick for an unfair challenge on Clint Hill. Free kick taken by Clint Hill. 45:01 Substitution Emile Heskey goes off and John Carew comes on. 45:00+2:07 The players leave the pitch at half time. 45:00+1:55 Unfair challenge on Richard Dunne by Alan Lee results in a free kick. Direct free kick taken by Richard Dunne. 45:00+0:29 James Collins gives away a free kick for an unfair challenge on Alan Lee. Darren Ambrose shoots direct from the free kick, save by Brad Friedel. 44:27 The official flags Emile Heskey offside. Clint Hill takes the free kick. 42:22 Darren Ambrose has an effort at goal from a long way out that goes wide of the right-hand post. 40:27 Ashley Young takes the inswinging corner, Header from close range by Emile Heskey clears the bar. 38:01 Alan Lee has an effort at goal from 12 yards. 36:26 Corner taken by James Milner from the left by-line to the near post. 35:59 Ashley Young restarts play with the free kick. 35:59 Booking Nick Carle receives a yellow card for unsporting behaviour. 35:51 Foul by Nick Carle on Stiliyan Petrov, free kick awarded. 34:57 Assist on the goal came from Stewart Downing. 34:57 GOAL - James Collins:Crystal Palace 1 - 1 Aston Villa James Collins finds the back of the net with a headed goal from close in. Crystal Palace 1-1 Aston Villa. 33:21 Free kick awarded for an unfair challenge on Alan Lee by Richard Dunne. Danny Butterfield crosses the ball from the free kick right-footed from right wing, Brad Friedel makes a save. 32:45 The ball is crossed by Ashley Young. 27:09 Neil Danns takes a shot from 18 yards. Save by Brad Friedel. 26:06 The ball is swung over by James Milner. 23:54 Assist by Darren Ambrose. 23:54 GOAL - Johnny Ertl:Crystal Palace 1 - 0 Aston Villa Johannes Ertl finds the net with a headed goal from close range. Crystal Palace 1-0 Aston Villa. 22:56 Nick Carle decides to take a short corner. 22:31 Shot by Emile Heskey. Julian Speroni makes a save. 22:14 Free kick awarded for a foul by Johannes Ertl on Fabian Delph. Stiliyan Petrov restarts play with the free kick. 21:36 The referee blows for offside. Free kick taken by Julian Speroni. 20:28 Free kick awarded for a foul by Alan Lee on James Collins. James Collins takes the direct free kick. 18:31 Free kick awarded for a foul by Richard Dunne on Alan Lee. Free kick crossed right-footed by Darren Ambrose, clearance made by Stephen Warnock. 17:58 Free kick awarded for an unfair challenge on Nathaniel Clyne by Ashley Young. Julian Speroni takes the direct free kick. 17:11 Long range effort on goal by Johannes Ertl goes wide left of the goal. 15:44 Free kick awarded for an unfair challenge on Emile Heskey by Johannes Ertl. Richard Dunne restarts play with the free kick. 13:03 Free kick awarded for an unfair challenge on Alan Lee by James Collins. Direct free kick taken by Julian Speroni. 12:28 Free kick awarded for a foul by Alan Lee on Stephen Warnock. Free kick crossed by James Milner, Alan Lee manages to make a clearance. 10:02 Inswinging corner taken from the right by-line by Stewart Downing. 9:44 Clint Hill challenges Emile Heskey unfairly and gives away a free kick. Stiliyan Petrov restarts play with the free kick. 9:25 Johannes Ertl gives away a free kick for an unfair challenge on Stiliyan Petrov. Richard Dunne takes the free kick. 7:52 Outswinging corner taken right-footed by Darren Ambrose from the right by-line, clearance by Luke Young. 6:20 The ball is crossed by Stewart Downing. 3:25 James Milner sends in a cross. 2:39 Corner taken left-footed by Stewart Downing from the right by-line, Clint Hill manages to make a clearance. 2:13 Alan Lee gives away a free kick for an unfair challenge on James Collins. Brad Friedel takes the free kick. 1:40 The assistant referee signals for offside against Ashley Young. Indirect free kick taken by Julian Speroni.